If you have a mobile home, then there may come a time when you have to decide whether you should fix or replace your roof when leaks start developing. Over time, the material used will wear out, or it can become damaged due to weather conditions such as high winds, hail, snow, rain, etc. Even an errant tree limb could cause serious damage to your roof. Rubber, which is a pliant and affordable material. This option is easiest to replace and repair so that it can be used for many years without fear of expensive damage. TPO is in the family of rubber roofing materials but is actually a synthetic rubber. TPO has the ability to be fused together, to create virtually seamless installations. Hot air fused seams have proven to be an extremely reliable system. These seams are up to 6x stronger than glued seams and 3x stronger than taped seams. 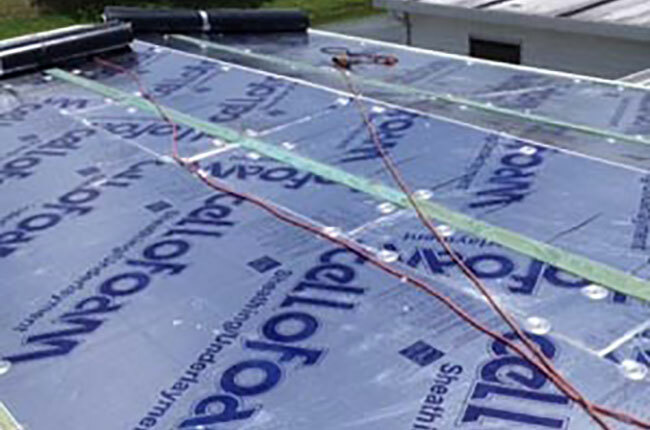 Seams are the most vulnerable parts of a roof and with a TPO membrane roof, these vulnerable areas are virtually eliminated. Another advantage to TPO membrane roofs are that they are commonly applied as white roofs, offering a reflective property rarely found in any roof system, allowing the roof to reflect as much as 87% of the sun’s damaging UV rays away from the roof. This reflectivity offers substantial cooling advantages, especially in warm weather climates such as Florida. Asphalt, in the form of shingles, is expensive and heavy. These are not ideal for low sloped roofs. Also, because there are weight restrictions for roofing on a mobile home, only one layer of asphalt shingles can be applied and that means more roofing problems in the future when your shingle roof needs to be replaced. When you choose to just fix a leaking roof, you have to worry about further leaks and more damage plus the inefficiency of the roof. Choosing to repair a roof will save money right now, but keep in mind that it could be costly later if the repairs do not hold up well. Essentially, if you need something quick and low in cost, then a mobile home roof repair could be an option to consider, but understand that repairs are usually temporary, and roofs that have been patched often develop leaks around the repair itself. The benefit to choosing a full replacement is that you have the ability to select a modern & superior technology, such as TPO which will be durable, relatively affordable, and simple to maintain. This pliable material is heat sealed so that it has no seams, and that means a leak proof option. Additionally, it will not crack under extreme heat or cold, making it an ideal roof for a home anywhere. It reflects the light, meaning it will keep your home more comfortable no matter the weather, and will help you save money on your energy bill. When you have your roof replaced, choosing TPO membrane is certainly the best option. If you feel you might need a mobile home roof over or even a mobile home roof repair, then contact us to find out more about the costs and the process. You can fill out our online inquiry form and we will get back to you as soon as possible. Additionally, you could call us at 800-297-3758, and we are available 24 hours a day.